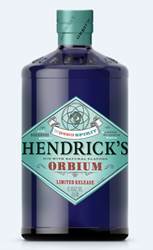 NEW YORK – Hendrick’s Gin is pleased to expand its taste continuum with a limited-edition US arrival known as Orbium. Orbium is distilled in exceedingly small batches and has a limited window of existence. A reinterpretation of the rounded house style of the original Hendrick’s Gin, Orbium is instilled with additional extracts of quinine, wormwood and lotus blossom, and has a curiously exquisite flavor that sits roundly on the palate. Orbium is a new expression from Hendrick’s, created by its Master Distiller Lesley Gracie, previously released in the UK and only available to a small number of on-premise accounts. Lesley possesses a fierce curiosity and an absolute skill for creating new and expansive tastes and flavors using an array of botanicals. Orbium has been born from this natural inquisitiveness and follows on from previous trade-only liquid innovations. It will be available at select bars throughout the United States. Orbium contains the same distillates as traditional Hendrick’s Gin, however the same remarkable Master Distiller that broke conventions by infusing gin with essences of cucumber and rose has now taken gin in a completely new direction. The liquid is infused with flavors that are traditionally associated with classic gin libations; quinine found in tonic (G&T) and wormwood found in Vermouth (martinis). The addition of lotus blossom exquisitely balances the overall flavor and the trinity of these essences combines to create a complex gin with surprising brightness and a finish that is uncommonly long. The result is an unfamiliar taste that is peculiarly familiar in character, designed to open previously unexplored dimensions of gin as it spirals from floral into an altogether deeper and alluringly bitter place. A perfect synergy of flavor creating a delicious, unexpected gin offering a different dimension to the Hendrick’s house style making it perfect for the martini obsessed imbiber. Orbium derives from the word ‘orb’, the plural of Orbis and the Latin for circle. It is inspired by Lesley Gracie’s description of the liquid’s journey. It is beautifully presented in the same iconic apothecary style bottle that is now synonymous with Hendrick’s, albeit in a sumptuous dark blue, inspired by the key essence of lotus. It also features an ‘all seeing eye’ on the label, as a continuous circle and a reference back to the liquid’s rounded character. Invention has always been at the heart of the gin maker’s DNA and Lesley is constantly exploring innovative ways to excite the bartender world with unusual flavor combinations. Hendrick’s, with the additions of the now iconic cucumber and rose, was the first step on a journey that saw Battersea and Quinetum cordials launched exclusively to the bartender community. In 2014, Lesley undertook an expedition to the Venezuelan rainforest in search of exotic new botanicals and flavors. The subsequent launch of the limited edition Kanaracuni Gin (325L) was the latest in a line of bartender exclusive liquids, however, for the first time one of these experiments has been made available to bartenders beyond sample quantities, with a first release of 5,000 cases of Orbium. Orbium is available initially in select bars in the US. HENDRICK’S is a deliciously super premium gin, made with a number of unusual twists. To deliver a most curious and delightfully unique flavor, Hendrick’s combines a distinct blend of eleven botanicals, as well as the signature infusions of cucumber and rose petals, producing a wonderfully refreshing gin with a delightfully unique aroma. Hand crafted in Scotland in miniscule batches by William Grant & Sons, Hendrick’s is the only gin that uses a marriage of spirits from both a Carter-Head and Copper Pot Still, a combination that produces a divinely smooth gin that has both the required character and balance of subtle flavors. Since Hendrick’s was first introduced to America nearly 15 years ago, it has gained widespread acclaim and received numerous awards, including a Double Gold medal in the 2014 Fifty Best Gin Awards; ‘Gin of the Year’ at the Food and Wine Magazine Awards and voted ‘World’s Best Gin’ by the Wall Street Journal. Hendrick’s Gin has an ABV of 44% and an SRP of $34.99. Please enjoy the unusual responsibly. For further information, visit www.hendricksgin.com. William Grant & Sons Holdings Ltd. is an independent family-owned distiller headquartered in the United Kingdom and founded by William Grant in 1887. Today, the global premium spirits company is run by the fifth generation of his family and distils some of the world’s leading brands of Scotch whisky, including the world’s most awarded single malt Glenfiddich®, The Balvenie® range of handcrafted single malts and the world’s third largest blended Scotch, Grant’s®, as well as other iconic spirits brands such as Hendrick’s® Gin, Sailor Jerry® Spiced Rum, Tullamore D.E.W.® Irish Whiskey, Monkey Shoulder® Blended Malt Scotch Whisky and Drambuie® Scotch Liqueur. William Grant & Sons has been honored as “Distiller of the Year” by the prestigious International Wine & Spirit Competition and International Spirits Challenge 12 times over the past 13 years, including the most recent award in 2017. Founded in 1964, William Grant & Sons USA is a wholly-owned subsidiary of William Grant & Sons, Ltd. and features one of the fastest growing spirits portfolios in the USA with brands including Glenfiddich, The Balvenie, Hendrick’s Gin, Sailor Jerry Spiced Rum, Tullamore D.E.W. Irish Whiskey, Drambuie, Milagro Tequila, Grant’s, Hudson Whiskey, Gibson’s Finest, Monkey Shoulder, Clan MacGregor, Reyka Vodka, Solerno Blood Orange Liqueur, Montelobos Mezcal, Ancho Reyes, Flor de Caña Rum, The Knot and Raynal French Brandy. For more information on the company and its brands, please visitwww.grantusa.com.